The new national survey by the Pew Research Center, conducted Oct. 30-Nov. 6 among 2,003 adults, finds that two-thirds (67%) favor requiring chain restaurants to list calorie counts on menus. But just 31% support limits on the size of sugary soft drinks in restaurants and convenience stores – 67% oppose this idea. More than half (55%) favor banning TV ads of unhealthy foods during children’s programming, but barely a third (35%) supports raising taxes on sugary soft drinks and unhealthy foods. On each of these policies, Democrats and women are more supportive than Republicans, independents and men. While most agree that obesity is a very serious public health problem, the public is divided as to whether the country is making progress or losing ground in dealing with obesity. 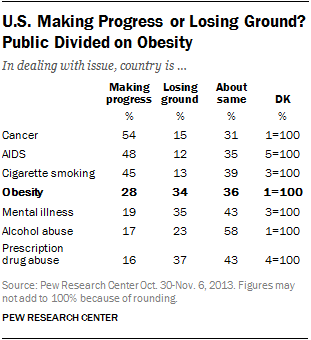 Slightly more people say the U.S. is losing ground (34%) than making progress (28%), with 36% saying things are about the same as they have been. How much can the government do to reduce obesity? Roughly six-in-ten believe government policies and programs can do “a lot” (26%) or “some” (35%); about one-in-five (22%) say that government policies can do “not much” and 14% say they can do “nothing at all” to reduce obesity. Obesity ranks high among perceived public health problems: About seven-in-ten adults say it is an extremely (24%) or very (45%) serious public health problem. 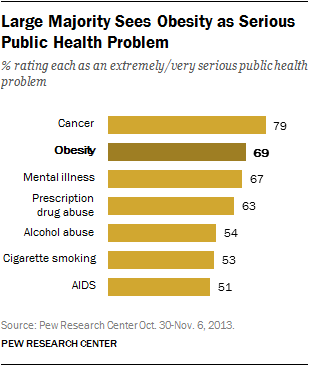 Americans view obesity as a less serious public health problem than cancer (79%), but similar to mental illness (67%) and more than abuse of prescription drugs (63%) or alcohol (54%). Far fewer Americans say the nation is making progress in dealing with obesity (28%) than in dealing with cancer (54% making progress), AIDS (48%) or cigarette smoking (45%). But more say progress is being made on obesity than on mental illness (19%), alcohol abuse (17%) or prescription drug abuse (16%). Those who see obesity as a very serious problem are about twice as likely as those who do not to say the nation is losing ground in dealing with the issue (40% vs. 19%). 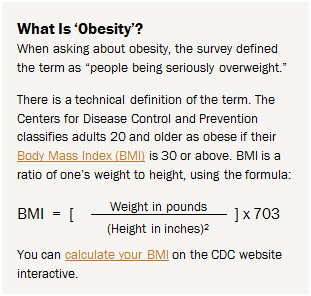 Women are slightly more likely than men to say that obesity is a serious public health problem (72% vs. 66%). But women also are more likely to believe that the country has been making progress on the issue (32% vs. 24% of men). In addition, Hispanics (83%) and blacks (75%) are more likely than whites (65%) to rate obesity as a serious public health problem. Blacks are more optimistic on the issue: 37% believe the country is making progress on obesity while just 16% say we are losing ground. By comparison, 39% of Hispanics and 36% of whites feel we are losing ground. More Democrats (77%) than Republicans (61%) view obesity as a very serious public health problem. Democrats are more likely than Republicans to see the country as making progress (36% vs. 24%). Those who describe themselves as overweight are as likely as others to say that obesity is a very serious public health problem (70% vs. 69%) and have similar views about whether the country is making progress or losing ground on the issue. About six-in-ten Americans (63%) say obesity has consequences for society that go beyond personal impact. Only about half as many (31%) say obesity does not have a major societal impact beyond the individual level. Majorities in virtually every demographic and political subgroup say obesity has social consequences beyond the individuals affected. Republicans (60%), Democrats (67%) and independents (63%) are about equally likely to say obesity has social consequences, as are men (62%) and women (64%). Perhaps the biggest divide is by education: 76% of college graduates say obesity has social consequences beyond the individuals affected, compared with 68% of those with some college and 51% of those with a high school degree or less. Among those younger than 30, 55% say obesity has consequences for society beyond the personal impacts, 39% say it does not have a major societal impact. Among older age groups, about three-in-ten say obesity does not have a major impact on society. While most see obesity as a substantial public health issue, there is limited support for the government playing a major role in anti-obesity efforts. 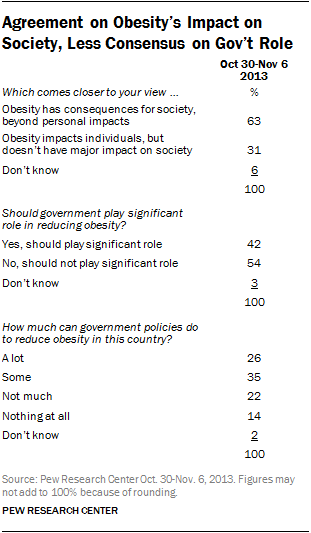 Overall, 42% say government should play a significant role in reducing obesity, 54% say it should not. While majorities of Republicans and Democrats say obesity has broad social consequences, there are sharp partisan differences about whether the government should have a role in reducing obesity. By a margin of 60%-37%, Democrats believe the government should play a significant role in curbing obesity. But just 20% of Republicans say this, while 77% of Republicans do not want the government to play a significant role. Among independents, more say the government should not play a significant role (56%) than say that it should (41%). There are differences within the Republican Party on this issue. Nearly nine-in-ten (89%) Republicans and Republican leaners who agree with the Tea Party oppose a significant role for the government in reducing obesity. Among non-Tea Party Republicans, 65% oppose a government role. Not surprisingly, views on what government should do are closely linked to perceptions of what the government can do. About one-in-four adults (26%) think government policies can do “a lot” to reduce obesity and 35% say it can do “some.” Roughly one-in-five (22%) say that government policies can do “not much” and 14% say they can do “nothing at all” to reduce obesity. Among those who think that government policies and programs can do a lot to reduce obesity, 84% want the government to play a significant role. Nearly the opposite is true of those who believe such policies can do not much or nothing at all – 83% think the government should not play a significant role. Those who think government policies can do some to reduce obesity are split: 47% think the government should play a significant role and 51% say it should not. Among the public overall, majorities of blacks (66%) and Hispanics (69%) say that government should play a significant role in reducing obesity. By contrast, whites are far less likely to think the government should be involved. Just a third of whites (33%) say the government should play a significant role in addressing obesity, while 64% disagree. 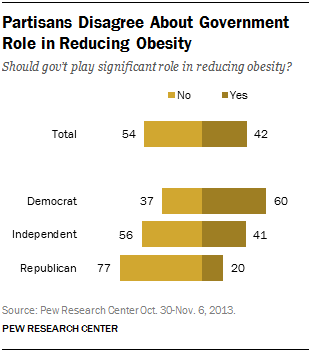 There also are age differences in views of the government’s role on obesity. About half (54%) of adults ages 18-29 say the government should play a significant role in reducing obesity, compared with just 33% of those ages 65 and older. While college graduates are more likely than those who have not attended college to describe obesity as having societal consequences, they are no more likely to support major government efforts to deal with the issue or to believe that government anti-obesity efforts are likely to be effective. People who describe themselves as overweight are about as likely to want a significant government role (40%) as those who describe themselves as about right or underweight (43%). When it comes to specific public policies aimed at reducing obesity, the public is of two minds. Proposals focused on information and advertising draw more support than opposition. But proposals that would affect an individual’s choice more directly are broadly opposed. 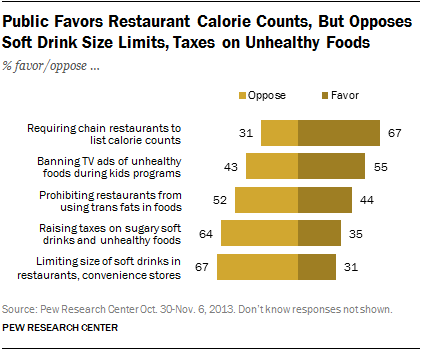 Most people are in favor of requiring chain restaurants to list calorie counts on menus (67%) and most also support a ban on advertising unhealthy food during children’s television programming (55%). 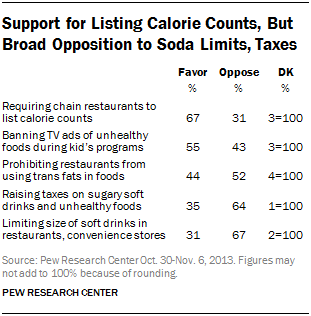 But majorities oppose a limit on soda size in restaurants and convenience stores (67%) as well as higher taxes on unhealthy foods and soft drinks (64%). All five of the policies have more support from women than men, by about 10 percentage points in each case. And in all five cases, Democrats favor a more restrictive food policy than Republicans and independents. Limiting the size of soft drinks in restaurants and convenience stores – a policy passed in New York City earlier this year, but invalidated by a New York judge – faces broad opposition across virtually all groups. Democrats oppose this idea by a 57% to 41% margin. Opposition outpaces support among independents by 69% to 30%, and just 19% of Republicans would favor soda-size limits while 78% would oppose them. There also are partisan differences in opinions about raising taxes on sugary soft drinks and unhealthy foods: 45% of Democrats, 33% of independents and just 24% of Republicans favor higher taxes on unhealthy foods. Among Democrats, a majority of liberals (67%) supports this proposal compared with 38% of the party’s conservatives and moderates. More Democrats (63%) than Republicans (47%) favor banning ads for unhealthy food on children’s TV shows, and while there is less support overall for banning restaurant trans fats, the partisan gap in views is similar (51% of Democrats favor vs. 35% of Republicans). Nearly half of those under 30 favor raising taxes on sugary soft drinks and unhealthy food (48%) and 45% favor limiting the size of sugary soft drinks. By contrast, only about a quarter of those 50 and older support each of these proposals.